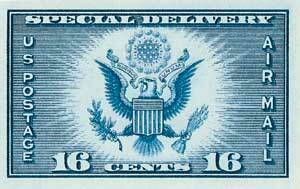 U.S. #CE1 – The first U.S. airmail special delivery stamp. On August 30, 1934, the U.S. Post Office issued its first Airmail Special Delivery stamp. 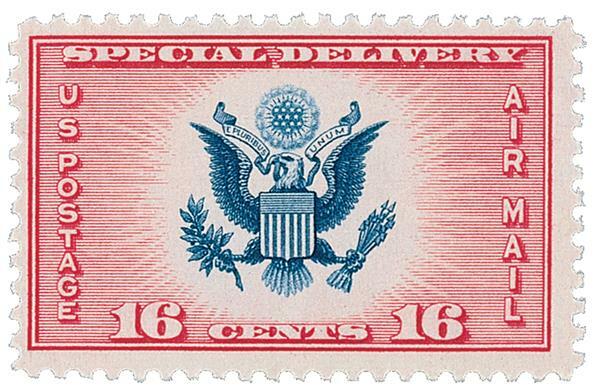 The 16¢ blue Airmail Special Delivery stamp was issued to prepay, with one stamp, the air postage and the special delivery fee. Mail with this stamp would travel by plane to its designated post office, where, upon arrival, a messenger would deliver it immediately to the recipient. 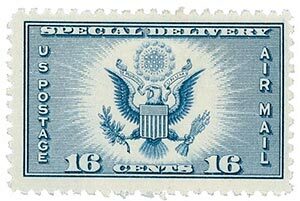 U.S. #CE2 – The 1936 airmail special delivery stamp. President Franklin D. Roosevelt, who was an avid collector, designed the stamp. Its first day of sale was August 30th, at the convention of the American Air Mail Society in Chicago. Two years later, the stamp was reprinted using two colors – carmine and blue. Airmail special delivery stamps were only in use for a brief time. After 1936 the fees for special delivery service on airmail was to be paid by additional regular special delivery stamps. 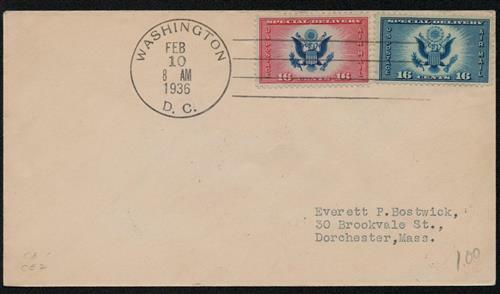 U.S. #CE1-2 – 1936 First Day Cover with both airmail special delivery stamps. U.S. #CE1 was part of the “Farley’s Follies” debacle of the 1930s. Starting in 1933, Postmaster General James Farley had sheets of newly produced stamps removed before they were gummed and perforated. He gave them to President Roosevelt and other high-ranking officials. Collectors protested – these were specifically made rarities that were not available to the public! On February 5, 1935, the problem was solved. All the stamps issued since March 4, 1933, were re-issued in imperforate, ungummed condition in such quantities as the public required. U.S. #771 – The imperforate Farley’s Folly stamp of 1935. U.S. #771 was the last of Farley’s Follies. It has the exact design and color of #CE1, and paid the extra fees on Airmail Special Delivery. The stamp was sold at the Philatelic Agency for only two months. The difference between U.S. #771 and the original “Folly” version (the stamps given as gifts to Roosevelt and others), is that the normally issued stamp is imperforate. This entry was posted in August 2017, This Day in History. Bookmark the permalink. 3 Responses to "This Day in History… August 30, 1934"
Good information. I was not aware of this. This 1936 stamp is to me one of the most beautifully designed stamps. Especially the two color one. But it wasn’t the first to combine airmail and special delivery postage. That was Scott #C3, the inaugural airmail stamp issued May 8, 1918, with the picture of the Jenny airplane – yes the one where one sheet printed the plane upside down. The 24 cents postage included the 10 cent special delivery charge. In June, the airmail rate was reduced with the issuance of #C2 for 16 cents which still include 10 cents for special delivery. It wasn’t until December 1918 that special delivery was dropped and #C1 was then issued for 6 cents. You will notice that when Scott Catalog people assigned catalog numbers, in this case they sequenced the numbers by denomination value and not issue date. So the beautiful stamp above was strictly speaking, the third stamp to combine the two rates. So much for arcane details. to read about the stamps and their stories.